Unions representing nurses and other NHS staff have written to the chancellor to demand a 3.9% pay rise and an extra £800 to make up for the "cut" they have seen in recent years. Fourteen unions have joined together to ask for the increase, saying pay has fallen by 15% since 2010 once inflation is taken into account. They said it was unfair ministers had selectively lifted the cap by agreeing a rise for police and prison officers. But the British Medical Association, the doctors' union, has not put its name to the letter, which has also been sent to the devolved nations. 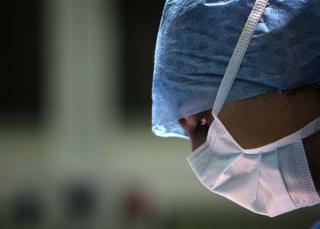 In it, the unions argue that increasing pay would help tackle the shortages of staff being seen in the health service. Earlier this year, research by the Royal College of Nursing suggested there were 40,000 posts unfilled - one in nine of the total. The cost of the pay rise, which the unions want implemented across the UK from next year, would total £2.5bn. It comes after ministers agreed to give police officers a 1% rise plus a 1% bonus, with prison officers getting a 1.7% rise - both funded from existing budgets. The health unions, which represent a wide range of staff including nurses, midwifes, cleaners, porters, pharmacists, paramedics and dental technicians, said that still represented a pay cut. Since 2010, annual pay settlements have been frozen and then capped at 1% for public sector workers. Unison head of health Sara Gorton said: "Health workers have gone without a proper pay rise for far too long. "Their wages continue to fall behind inflation as food and fuel bills, housing and transport costs rise." RCN general secretary Janet Davies said it was important the money to pay for the rise would have to be found by the Treasury rather than taken from the NHS budget. "When ministers hold pay down, it drives too many nurses out of the NHS," she added. A government spokeswoman said: "Public sector workers, including NHS staff, do a fantastic job, and the government is committed to ensuring they can continue to deliver world-class public services. "The government will continue to ensure that the overall package is fair while also being affordable to taxpayers as a whole." She added next year's pay award would be "discussed and agreed" as part of the Budget process and through the official pay review bodies and would be "set out in due course".